What if it were legal to gamble on the time someone else is going to die? It is, if you invest in a life insurance product called a viatical. When the sister of a law firm client dies in her sleep of carbon monoxide poisoning because of an apparently malfunctioning hot water heater, third year law student Elliot Lerner is asked to determine whether anyone could be held responsible in a wrongful death lawsuit. As he looks into the circumstances surrounding the death, he learns about viatical settlements—investment products designed to provide terminally ill patients with immediate cash in exchange for the right to their life insurance payouts when they die. The amount investors are willing to pay for a patient's death benefit depends on how much longer the patient is expected to live, because the investor must take over payment of the insurance premiums. "A terrific legal thriller, right up there with the best in the genre—immediately appealing, always intriguing, and very satisfying in the end." "A clever twist on a classic thriller model—the dead body and a mysterious insurance policy—with a bright young investigator who asks all the right questions, and an all-too-convincing gallery of suspects and motives. 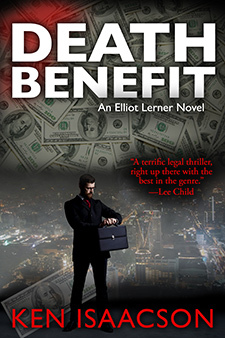 Law student Elliot Lerner's career is just starting in Death Benefit, and I can't wait to see what he does next." "A crackerjack thriller from start to finish. Death Benefit is a smart, fast paced, and thoroughly satisfying tale that readers of Grisham and Turow will undoubtedly enjoy!" "A terrific read! Ken Isaacson is a superb story teller, and Elliot Lerner is an engaging protagonist. Deftly plotted and artfully executed, Death Benefit is a compelling page turner with serious undertones. Plan to stay up late. Highly recommended." "An appealing hero, a conspiracy that might lead into the heart of the life insurance industry, millions of dollars gone missing... You will feel like you're in the conference room sitting across the table in Ken Isaacson's pull-no-punches legal thriller."